A 10-member delegation led by Mr Paul Michael Taylor, Director, Asian Cultural History Program Curator, Washington (USA) arrived here yesterday to visit various Sikh religious shrines of the Amritsar district. A scuffle broke out between an Assistant Sub-Inspector and an advocate when the latter was challaned for jumping the red light near the bus stand here today. In a major breakthrough, the team led by Dr Jai Rup Singh, Coordinator, Centre for Genetic Disorders, Guru Nanak Dev University in association with Dr Daljit Singh, a renowned ophthalmologist, supported by scientists from the National Institute of Health, USA, Institute of Human Genetics, Berlin, Germany, has identified three new cataract-causing genes in Indian families after 15 years of research. ‘Murdered’ servant produced in High Court! 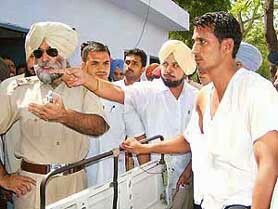 The use of alcohol and other drugs has become part of Punjabi culture. No wedding or a happy occasion is complete until liquor is served. However, in the past two decades, the pattern of drug use in the state has undergone a change in favour of synthetic drugs. The case of four girls of Chandigarh, who had become a subject of immense speculation for the media, especially electronic channels and the police, after they had fired in the air thrice in the Sarabha Nagar market area in Ludhiana on the night of May 27, is a classic example of how the media overkill can play with young lives. A seminar on foeticide and the PNDT Act was organised by the district administration and an NGO, UPKAR, at Shivalik Public School here yesterday. Mr Darabara Singh Guru, Health Secretary, was the chief guest and Dr Harinder Rana, Director, Health and Family Welfare, presided over the seminar. Women panches, sarpanches, councillors, teachers, girl students, and anganwari workers, among others, participated. People should work together and put Punjab first in terms of social equality, economic development and harmonious living as preached and practised by the Gurus. Gen S.F. Rodrigues (retd), Punjab Governor, stated this at an international seminar organised by the Dharam Prachar Committee of the SGPC to mark the 400th martyrdom of Guru Arjan Dev here today. The World Council of Arya Samaj (WCAS) will remove objectionable words, if any, from the 150-year-old book “Satyarth Prakash” authored by Swami Dayanand Saraswati in its endeavour to end mistrust between Sikhs and Hindus. He said the WCAS held Guru Nanak and Sikhism in high esteem. Mr Darshan Rattan Ravan, Chief Organiser of the National Adi Dharam Samaj, alleged at a press conference here today that the benefits of reservation were only availed by members of the Ravi Dass community. The Scheduled Castes comprised 37 communities, including Balmikis, in Punjab. He said almost all members of the Balmiki community were still deprived of reservation benefits. To provide better health services in the rural areas, the government has decided to give rural dispensaries on contract basis to doctors. At least, 21 rural dispensaries have been identified to be given on the contract basis. An 8-month-old child was burnt alive in a fire alleged due to short-circuit in Vijay Nagar, near Azeemgarh, on the outskirts of the town today. The newly opened branch of Desh Bhagat Ayurvedic College and Hospital , Desh Bhagat Hospital and Panchkarma Centre, at Mandi Gobindgarh has started treating patients. Handloom items and three motor cycles were destroyed in a fire at Calibre Market here this evening. An awareness workshop on GM crops with special reference to Bt cotton and its regulatory aspects was organised here yesterday. Over 125 state agriculture department officials from seven districts of Malwa cotton belt and progressive farmers of the region participated in the workshop. To prevent the debt-ridden farmers from committing suicides, the All-India BJP Kisan Morcha today asked the Union Government to give loans for agriculture purposes to the farmers at an interest rate of 4 per cent and implement the crop insurance scheme without any delay. One person, who was hurt in a clash here yesterday, succumbed to his injuries at the PGI, Chandigarh, today. The city police arrested Geeta Rani, wife of Satpal, a resident of Shastri Nagar here, under Sections 21, 61 and 85 of the NDPS Act on Saturday and seized 10 gm smack from her. Raj Kumar, alias Baloo of Bihar and at present residing at Shastri Nagar here, was arrested on Saturday with 5 gm of smack in his possession by SHO Baldev Singh and ASI Parkash Singh under the guidance of DSP Naresh Kumar. A case has been registered. Christians in Pakistan are well settled and enjoying all facilities being given to the minorities, Mr Ishfaq Fateh, Principal of Saint Peter High School of Toba Tek Singh (Pakistan), leading a delegation of Christian students to Punjab, said here today.